As someone who spends most of her working and non working hours surrounded by children and children’s books, I am pretty savvy with how our children’s room is organized and what all the stickers and categories mean. However, not all of it is obvious and I want to share some of the small pockets of the children’s collection with you so that it is easier for you to find just the right book. We have updated our signage to make it easier to find the right section, but there are still some nooks and crannies that you might not know about. If you are looking for books to help you manage the joys of parenthood, including everything from pregnancy to how to have tough discussions with older children, then this area is a great resource. There are non fiction books for parents, DVD’s, and some books to share and read with your children on a variety of topics. Whether you are facing the wonder of potty training or the teen years, there are books here to help. 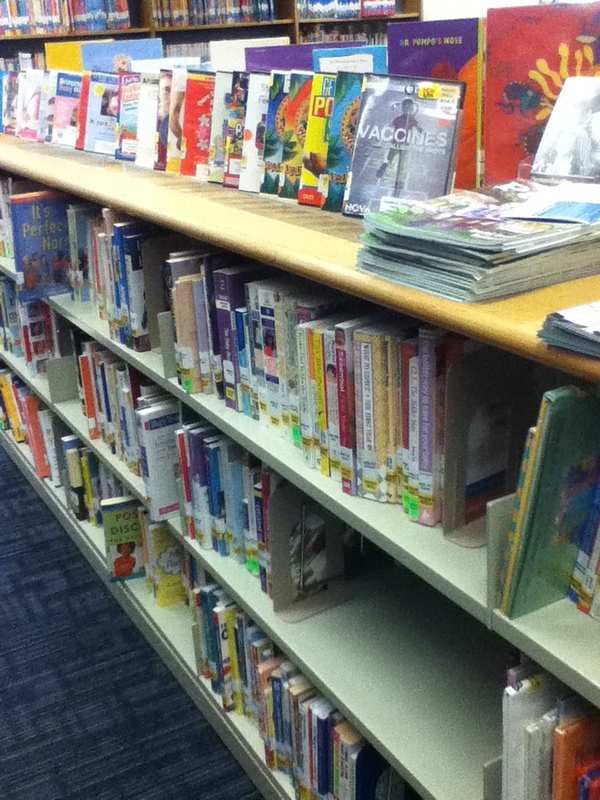 There are also Parent’s Magazines and publications that are free to take. 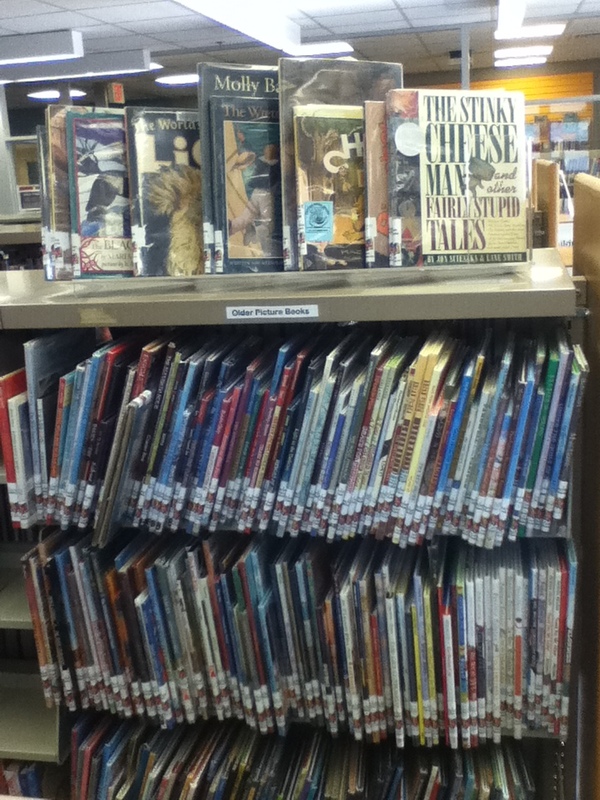 This shelf is right before the play area, so parents can browse with little ones still in sight. The call numbers for these materials all begin with Parent. These books typically look like the average picture book. However, they are shelved after the chapter books and tend to have more words and/or subject matter that might require more explanation or discussion than expected from a picture book. These are great options for readers who are ready for chapter books but do not want to leave behind picture books or easy readers. The call numbers for these books all begin J OPB. 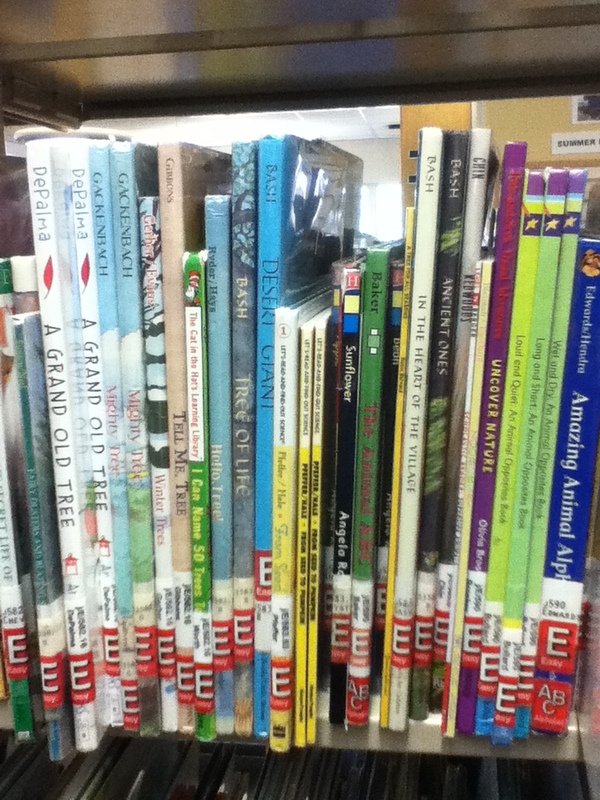 Trapped between the nonfiction books and the picture books are a couple rows on easy nonfiction. 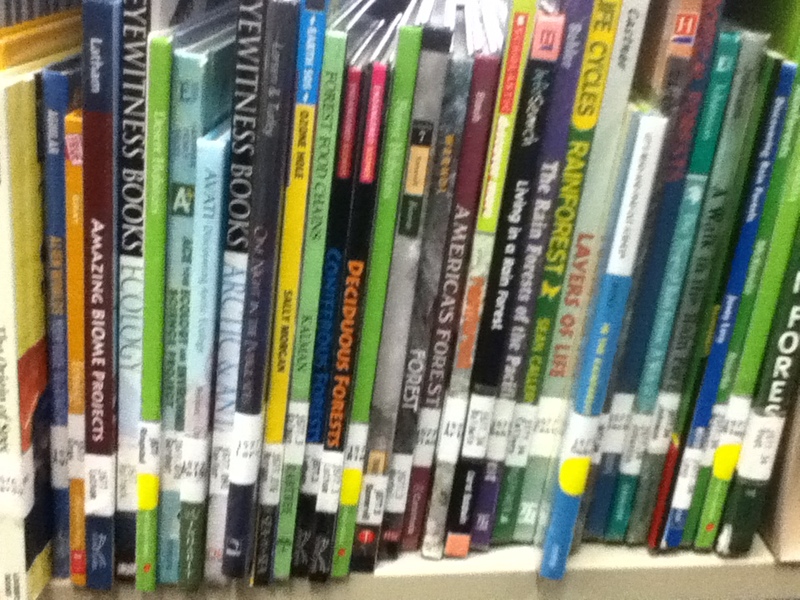 You can tell these nonfiction books apart from the rest because of the bold red E under the call number. These are non fiction materials especially suited for Kindergartners through second graders to explore on their own or for reading together. The text tends to be simple, with glossaries for the harder words, and plenty of pictures. The call numbers for these items begin with J E followed by a number. 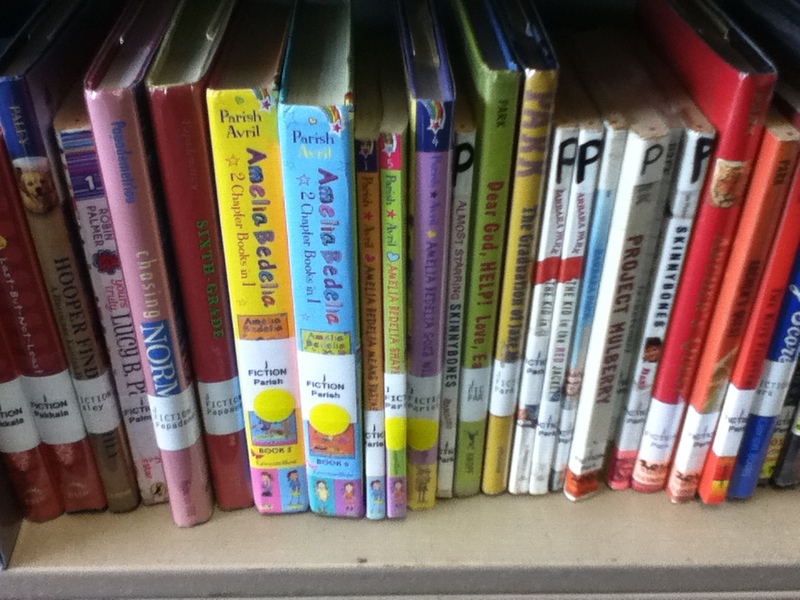 When exploring the fiction section (including series, science fiction, and mystery) and the nonfiction section of our children’s room, you might notice that some of the labels wear an extra yellow dot. This dot means that it is a transitional or easy chapter book. These books are not quite as easy to read as the easy readers wearing the blue stickers (shelved over by the picturebooks) but are great for the readers who are venturing into the world of chapter books and might be intimidated by the sheer size and lack of pictures in some. The these books tend to have a large font, lots of pictures, and less words on a page that other chapter books. 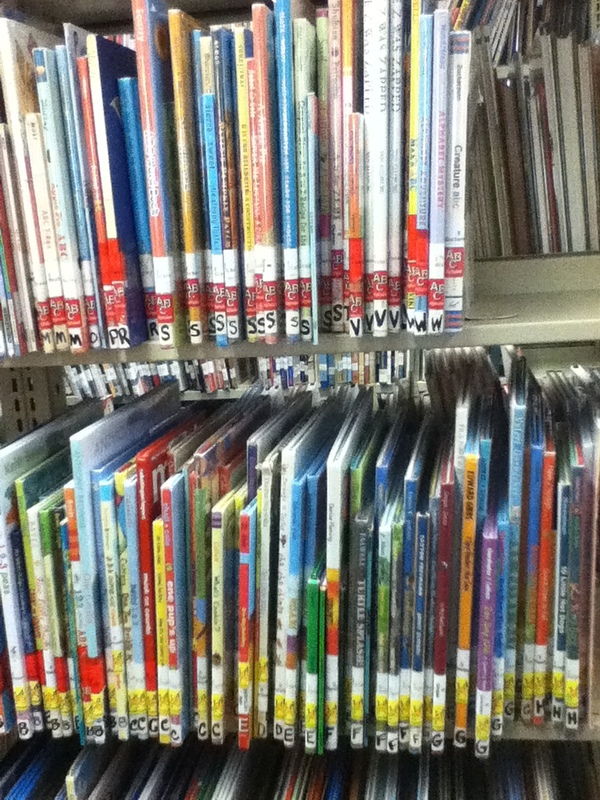 Between the Easy Nonfiction and the Parent’s Shelf lies a small section of picture books and easy nonfiction books that help teach numbers and letters. All of the books that specifically teach numbers have a yellow 123 sticker on the spine, and the alphabet books have a red ABC on the spine. The call numbers for these items begin with an ABC or 123 as appropriate. There are a few more special stickers and sections in the children’s room. Please, come explore the room, and if you need help finding anything or want to know what any of the labels mean, stop by the Children’s Desk and we will be glad to help!